It seems that the film industry follows the trend of not releasing quality, praiseworthy films until after the Academy Awards have come to a close. Thus is the case with Jaume Collet-Sera’s Non-Stop. 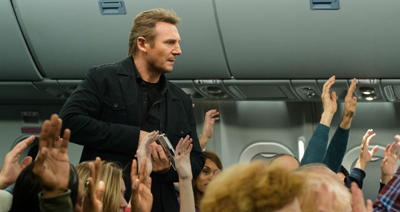 Non-Stop follows alcoholic Air Marshall Bill Marks (Liam Neeson) as he is faced with the time-sensitive task of paying off a terrorist before he kills passengers on a London-bound transatlantic flight. The hitch you may ask? The danger is that the terrorist is only communicating through text messaging. Surrounded by 150 possible targets and innocent human lives, Air Marshall Bill Marks must race against time before lives are lost. The plot of Non-Stop embodies elements of Die-Hard, Taken, and Speed. It should be a crowd pleaser with influences like those. However, the film falls short in almost every aspect that would deem it worthy of the price of admission. What was billed as a high-octane Liam Neeson action film, is actually the result of what appears to be Hollywood pulling names out of a hat to assign writers to a film. The story flails in the beginning when Air Marshall Bill Marks receives a text on the secret Air Marshall network, and his character automatically enlists the help of a fellow passenger, Jen Summers (Julianne Moore) to aid his investigation. From here, Bill Marks is trying to herd cats as he attempts to narrow down his focus on the terrorist. The story takes off in a vast array of convoluted decisions that the Air Marshall makes in order to subdue the killer, and restore order to the plane. These decisions seem forced, and unnatural pertaining to Marks’ character, thus creating distance between the audience and the film’s story. It’s too forced, and the film repeats that “rhythm” throughout its duration. There’s hardly any saving grace when one tries to shed light on Non-Stop. The fight scenes are poorly executed, and the cinematography of each sequence is so jarring that it’s impossible for the audience to feel connected to the event at hand. Liam Neeson is fighting the bad guy. We should feel some sense of achievement when he comes out victorious. Unfortunately, that isn’t the case. It may appear repetitious to berate the quality of a story so much, but when a story is the core foundation on which all of the aesthetics of cinema are built upon, then it’s particularly important to develop a well-structured story. Liam Neeson and Julianne Moore display their well-honed craft in almost every other film, however, their presence on screen is weak due to the lack of a solid character arc that resembles more of a squiggly line in the end. The talented Lupita N’yongo (12 Years a Slave) and Corey Stoll (Netflix’s House of Cards) appear in the film as supporting roles. N’yongo is barely seen, and is therefore unable to even deliver a memorable appearance. Stoll delivers a decent performance as an NYPD officer on vacation. The rest of the cast is forgetful, not due to acting ability, but to a lack of any memorable involvement with the plot. One must also be curious of the availability of cell phone reception and WiFi whilst the plane is flying. Last time I checked, there weren’t too many cell towers located over the Atlantic Ocean. Story flaws upon story flaws restrain Non-Stop from ever dreaming of competing with the likes of Die Hard, Taken, and Speed. If you’re considering a movie to catch over the weekend before Oscar Sunday, then I advise you to check out your local RedBox to view the nominees in all their glory, for a much more affordable price. You’ll leave Non-Stop unsatisfied, and concerned for the future of studio films. Hopefully the great writers of tomorrow are just up around the bend. Non-Stop opens today in Philly area theaters. I didn’t think his decisions were convoluted or “forced”. Someone was texting him, so he uses the plane’s surveillance cameras to see who might be texting him. He has people hold their hands up and stay in their seats at the end of 20 minutes. I don’t get why these decisions are “forced” or unnatural. What else should he have done?